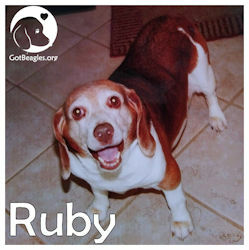 Our little Ruby was only with us for just under a year after adopting her through Midwest BREW. She lost her battle with cancer in August of 2018 at about 9 years old. We hold her dear in our hearts, waiting to see her again, with our other departed furry friends at the Rainbow bridge.